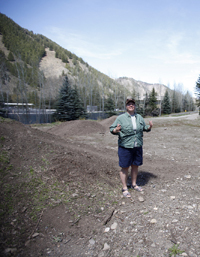 The Ketchum City Council last week approved a contract for services to construct Farnlun Park on a parcel of donated land. The city's newest park will occupy a narrow strip of land adjacent to the Ketchum-Sun Valley Wastewater Treatment Plant. The area is bordered by Meadow Circle, River Ranch Road and the Wood River Trail bike path, at the far southern reaches of the city. Valley resident Petra Morrison, whose family has lived in the area for more than 100 years, deeded the land to the city in 2009. The approximately quarter-acre parcel is part of the estate of her father, Oscar Smith Farnlun. Morrison also donated $22,574 to go toward development of the property. The park will serve as a turn-around area and rest stop for bike path users, Jen Smith, Ketchum Parks & Recreation Director, said in an interview. Plans call for a decomposed granite path, a couple of benches and shade trees. The park will be xeriscaped with plants such as lilacs and flowering perennials. The council on Monday, May 16, unanimously approved the contract with Webb Landscape, which will be the general contractor, for an amount not to exceed $17,312. That amount is what is left from Morrison's original donation. Work will begin in the next week, with completion expected by early July.